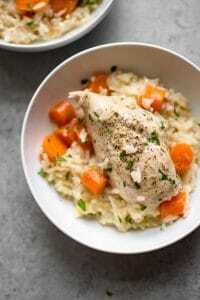 This Instant Pot chicken and rice recipe has tender, juicy chicken and the most amazingly soft and flavorful rice. You can even add carrots to make it a complete meal! Season both sides of each piece of chicken with salt & pepper. Press the sauté button on your Instant Pot. Add the oil and onion and sauté for 3-4 minutes. Stir in the garlic, then add the chicken broth, lemon juice, rice (rinse it first), Italian seasoning, and butter. If you want to add carrots, add those in at this point too. Leave the sauté button pressed so it heats up as you're adding the ingredients. Give the ingedients in the Instant Pot a good stir, and then immediately add the chicken pieces on top. Close the lid, set the valve to "sealing", and cook on high pressure for 18 minutes. Carefully do a quick pressure release once the countdown has completed. Serve immediately. If needed, season with salt & pepper to taste. I have tested this recipe multiple times in my 6-quart Instant Pot, and it has worked every time without a burn warning (I've heard this can happen in some of the larger Instant Pots when cooking certain recipes - such as ones with rice). I suggest following my instructions exactly as written for best results. If desired, use low-sodium chicken broth. I found this recipe to be perfectly seasoned with regular chicken broth, though. I've tested this recipe with larger and smaller chicken breasts. The smaller ones do tend to be slightly too cooked for my liking when I cook the recipe for 18 minutes. If they're particularly small, you may want to try reducing the cooking time by a minute or two. Makes 4 generous servings. If I was eating this by myself, it would be more like 6+ servings. Inactive time indicates the time it takes the Instant Pot to get up to pressure.